As we are in season for being thankful and the season for giving I want to thank all my clients for the opportunity to support them in the most amazing way possible; in the miracle of life, what an amazing gift and moment to be thankful for! I am so grateful! In appreciation I am hosting a Client Appreciation Gathering. I look forward to seeing all the women and their partners that I have supported on their journey to parenthood, and seeing how big and beautiful their children have grown. I will be sharing pictures of our gathering in a future post. Are you still looking for the perfect gift for a mother-to-be? There are so many things this highly consumerist society tries to convince mothers that they need! I know, I was one of them! Then I realized that all my baby needed was love, nutrition and warmth, and that my arms could provide it all... and for when my arms could not provide it? Maybe some clothes and a safe place to sleep... ok and some diapers ;) unless you plan on doing eliminations communication (see more on that below). I also learned that what made for the most loving and peaceful birth experience was the care and support I received during birth. With the high rates of unnecessary interventions and c-sections it is something that is very overlooked! One of the reasons I am a doula! So it comes from the heart and a place of service that I say that one of the better gifts a mother-to-be can receive is doula services to help her welcome her baby with love and peace. In the spirit of giving get $50 off the Basic Doula Package and $75 off the Full Doula Package if you purchase services by December 25th, 2015. Also, please remember that for any mother-to-be that you refer and contracts doula services with A Loving Birth you will receive a $25 gift card in appreciation for your support. Just fill out the gift certificate below for the amount of $50 (on me, or more if you want to add to it). 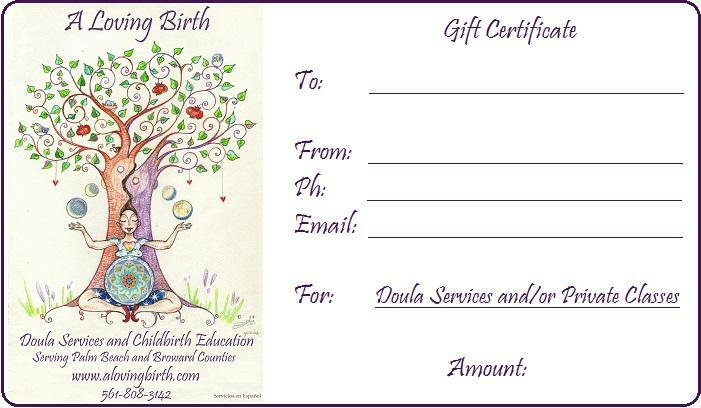 You will get a $25 gift card and the mother-to-be will get $50 off doula services! Thank you Elena C.! You will be receiving a $25 gift card in appreciation for referring a client that contracted doula services with A Loving Birth! So thankful to be a part of another loving birth in the making! Make sure you RSVP by calling 561-808-3142 as space is limited. 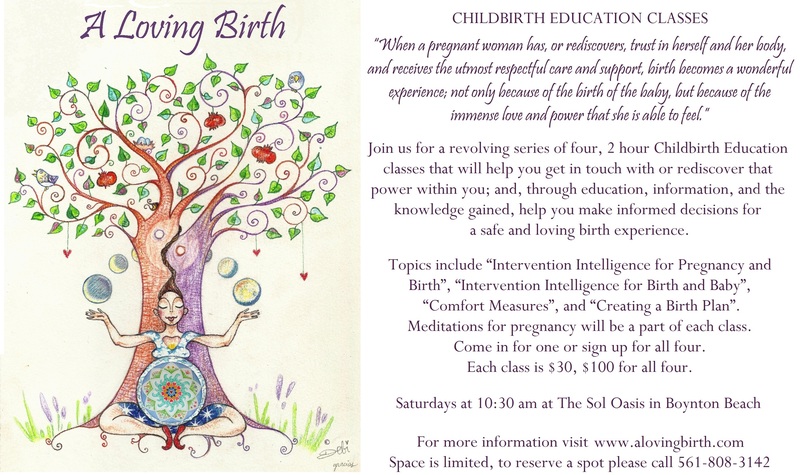 Private Childbirth Education Classes are always available for your convenience. As always, thank you for your continued love and support. Wishing you lots of love and happiness in this Holiday Season!